The current challenge at A Blog Named Hero is called Golden Oldie. The idea is to pull out one of our oldest stamps and use it. 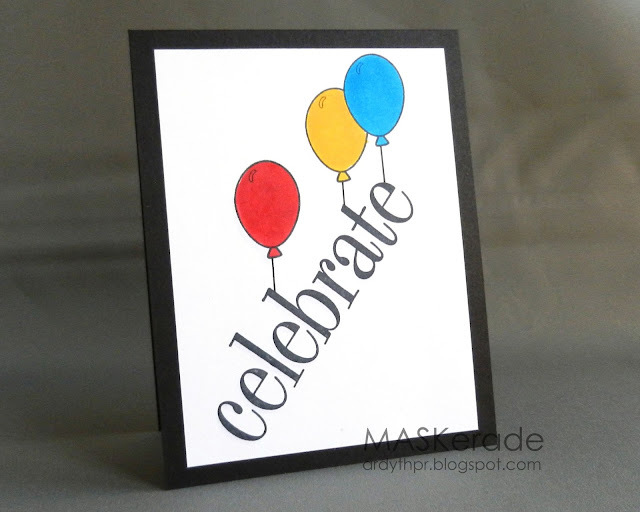 Back when I started stamping, there weren't as many stamp companies around - clear stamps were just starting up and many of the first stamps I purchased at my local scrapbooking store (now closed) were Hero Arts, including this 'celebrate', which I will never get rid of - it's a classic font and you can use it in so many ways! I thought it would be fun to have The Stamps of Life balloons 'lifting' the sentiment. I think it's safe to say that next time we take a picture like this, I will be the short one in the front! lol! Ardyth, I love this!!! What a fun scene with your sentiment, plus I'm loving the whole diagonal thing in general. AND, I love even more that vintage Ardyth looks just as good as present-day Ardyth. You are just a natural talent!! Thanks for sharing a photo of your lovely family ... I imagine that would be strange thinking you may be the shortest next time! I love the way you turned the sentiment and used classic primary colors. 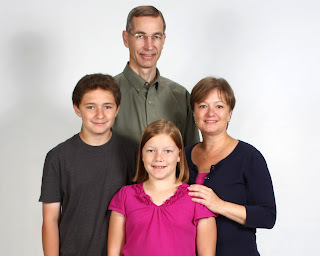 Love your family photo! And I'm with you on being the shortest...my little two have a ways to go but my 12 year old is about to pass me up! Wish I had more space in my craft area to pull some of my really old stamps out of storage. Your card is so effective at giving the illusion of the balloons lifting "celebrate" up into the air. So fun! Love seeing your beautiful family! Ardyth your card is fantastic, I remember that stamp. A beautiful family photo. 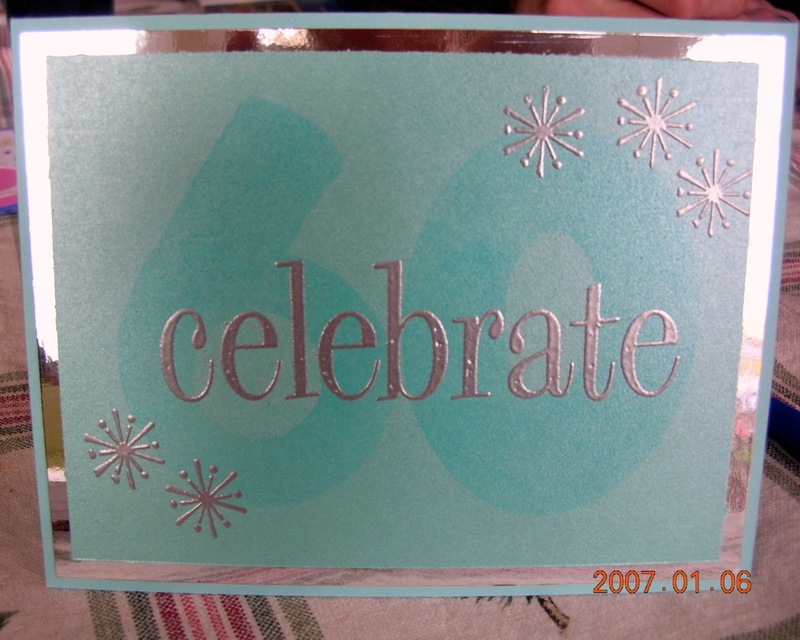 What a fantastic way to display the word celebrate, especially for a birthday! It is EZACTLY what the word would ask you to do if it could speak!! BTW, Kelly G. mentioned to me that the Anniversary link wouldn't let her link again after I told her you had fixed it. Thought you would like to know! keen of reading this website's post to be updated daily. It contains pleasant stuff. Congrats on your anniversary!!! Your card is well designed and fun! Thanks for playing with us at A Blog Named Hero!!! I love the balloons carrying the celebrate! What a fun card! Lovely family! That is a fabulous font and I love how the word is floating away on the balloons! 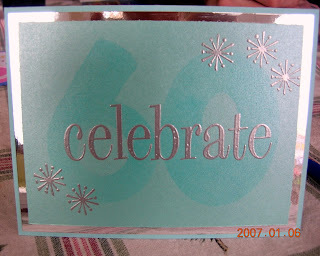 Love the 60th card too!